Consumers are increasingly jamming adverts, which is presenting a new headache for businesses that are spending a fortune placing their brands online. According to numerous surveys, many consumers use ad blockers because they feel the advertisements displayed are intrusive or are not relevant to them or use up their bandwidth. This rising phenomenon comes at a time when companies are setting aside huge budgets to put their adverts online. In 2014, Kenyan companies splurged Sh85.8 billion on advertising, according to data from media monitoring firm Reelforge. A majority of businesses say it is hard to resist the lure of mass advertising – the chance of reaching millions of consumers at the same time. But experts say corporates both large and small micro must critically rethink through their advertising decisions by mainly opting for sites that bring returns. This will help them come up with targeted adverts aimed at the right audience. A new study by Deloitte Global shows that the growth of companies using digital advertising has given rise to ad blocking. “Three quarters of adults in North America engage in some form of ad blocking already, though only 10 percent engage in four or more types of ad blocking,” says a new study by Deloitte whose findings Kenyan online observers say mirror that of local consumers. The study predicts that 10 per cent of Internet users across the globe over age 18 will be engaged in multiple advertisement blocking behaviours in 2018. 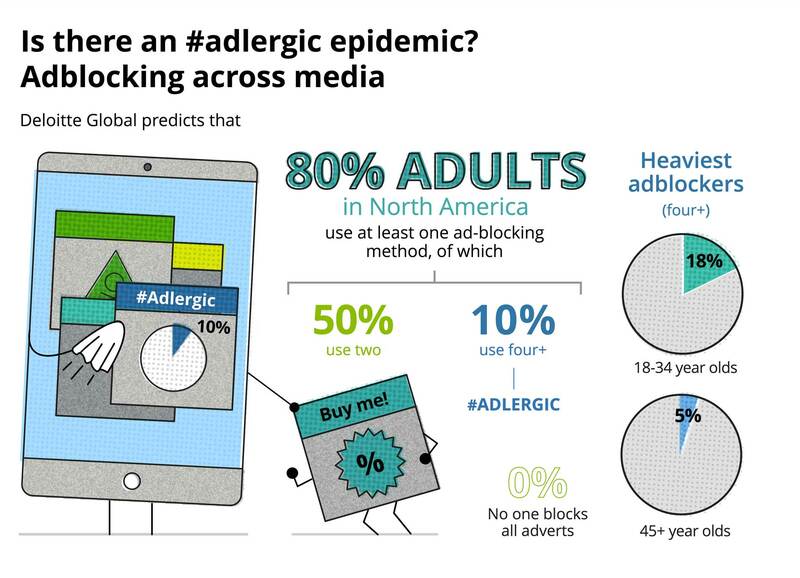 These users have earned the nickname “adlergic.” The most adblocking is being done by those who are younger, with higher incomes and more education … all of whose attention is coveted by advertisers. “We found that while about three-quarters of North Americans engage in at least one form of regular ad blocking, a much smaller subset of about 10 percent blocks ads across four or more types of traditional and digital media channels most of the time,” says the survey conducted in mid-2017. It polled 1,096 Americans and 1,090 Canadians aged 18 to 75, and measured ad blocking across various media and devices. The study says some forms of ad blocking (such as software on computers and mobile devices, and streaming music and video services) are growing relatively quickly, while other forms of ad blocking (such as ad skipping with personal video recorders (PVRs) or changing channels on TV or radio) are stable or growing slowly. “We predict the percentage of “adlergic” people will be about one percentage point higher in 2018,” says the study. To deal with this challenge, experts say businesses have to make well-considered decisions while allocating budgets. “You have to choose the correct media,” says Paul Muteshi the chief technology officer of a Nairobi-based mobile and web development company Webgurus Media. “Users are more likely to use ads blocking on non-reputable sites. Using reputable media such Twitter, LinkedIn and Facebook you’re likely to get some success. So it’s about choosing the correct media rather than making a decision to invest in advertising or not,” Mr Muteshi adds. The report says for advertisers eager to get around adblockers, the most obvious and biggest places to focus should be mobile and social. Kenya is among the front runners in internet penetration in the continent at 53 per cent, slightly lower than continental giants, South Africa and Nigeria who both clock slightly higher than of 60 per cent penetration showed a study by Consumer Insights, a market research company highlighting the huge potential for online advertising locally. The study released last November showed that chatting, social media, emailing, job search, information seeking, movies and videos, music, news, video calls, buying and banking, in that order, emerged as the activities that most Kenyans engage in while online.